The power steering system enables you to turn the steering wheel easily. When the car is not running, it is extremely hard to turn the steering wheel. 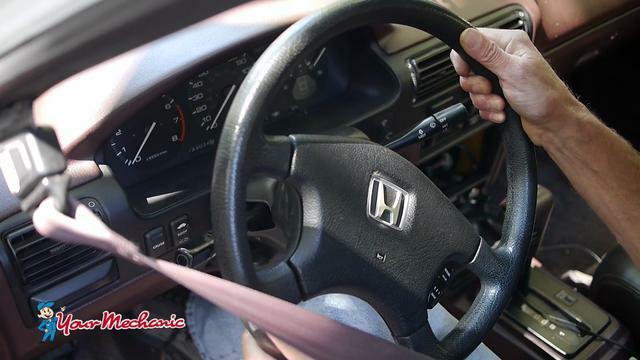 When the car is running, it is the power steering system that helps you turn the steering wheel so easily. The power steering system includes: power steering pump, fluid, belt, hoses and steering gear (rack and pinion). The steering gear connects the steering wheel to the suspension stub axles. When you turn the steering wheel, the power steering pump sends fluid to the steering gear that applies the pressure needed to turn the wheels. When the power steering pump is replaced, the power steering belt and hoses should be inspected as well. A mechanic should flush the power steering fluid when replacing the pump, and should then add the specific power steering fluid that your system requires. Verify that the power steering pump is bad. Remove and replace power steering pump. Add power steering fluid and bleed the system if needed. Inspect power steering belt and reservoir. Inspect rack and pinion system. Changing the steering fluid on a regular basis can prolong the life of the power steering pump. What common symptoms indicate you may need to replace the Power Steering Pump? Turning the steering wheel is difficult. Power steering fluid is leaking. Groaning-like noise when you turn the steering wheel. The power steering system aids the driver in steering their vehicle. The force required to turn the wheels of a car is very large, which is why it is so difficult to turn the steering wheel when your car is turned off. When your vehicle is running, the power steering system helps you get enough power to turn the wheels. When you turn your steering wheel, the power steering pump sends steering fluid to the rack and pinion steering gear. In the steering gear, this fluid applies the pressure that is needed to turn the wheels. This makes it so that it is easy for you to turn the steering wheel and control your vehicle. When the power steering pump fails, the system cannot send fluid to the steering gear, and your steering will be unassisted. Driving your car with unassisted steering is not only a hassle, but also unsafe. How much does Power Steering Pump Replacement cost? It depends on the type of car you drive and the auto repair shop you go to. We can help you and advise you to which mechanic in Bathurst NSW Australia can help you with a service and replacement.